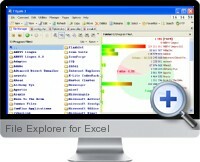 File Explorer for Excel is a utility to quickly and easily manage excel files. Using File Explorer for Excel you can view, move, delete or rename excel files even without Excel on your PC. File Explorer for Excel has a transparent interface of two panels. On the left panel there is your file tree. All you have to do is to click the file from the file tree and the next moment you can view the file on the opposite panel. This is a viable and affordable option for those without Excel who still need to manage Excel files. The File Explorer for Excel interface enables the management of Excel files with the utmost convenience.